Perhaps someone could tell me if Brook School does still exist or, if not, what is there now? The Brook School site was taken over by Richmond College (later the Sheffield College) in the 80s. The college site was derelict the last time I saw it. Don't know about the Brook site though. Thanks for the link, I can`t believe some of the goings on that happened there. Although my nan is buried in wardsend the last time i visited the site i was astonished to learn her grave stone no longer exists. Wards End is a shocking story.. There must be hundreds of recorded and personal experiences of things that go bump in the night. Post experiences here. Found this website. May be of interest to ghosthunters. Further Comments: The boiler room here was haunted by a pair of feet which hovered a half a metre or so from the floor. Think wearing the same socks & wellie's for a fortnight produces that result in most people! Indeed, spooky. Thanks for your input and welcome to this site ! The more posts, the better, cuz we alll learn a little more. here is my own personal ghost story, although through years of working in nursing homes i have seen plenty! the other night me and my partner were laid in bed looking at A PITSMOOR CAMERA book by jr wrigley, one of the pictures in the book was taken of osgathorpe park and i was telling my partner about a time when me and my friend had been on our way to earl marshall school and we saw a man walk across the top of the gennel that runs down between the houses that leads onto earl marshall road from osgathorpe park. we were online with the building on the left hand side of the picture that is attached and the begining of the gennel is about 20 yards in front of us. me and my freind both noticed the man but carried on chatting as schoolgirls do, when we got online with the gennel we looked left and the man had vanished. 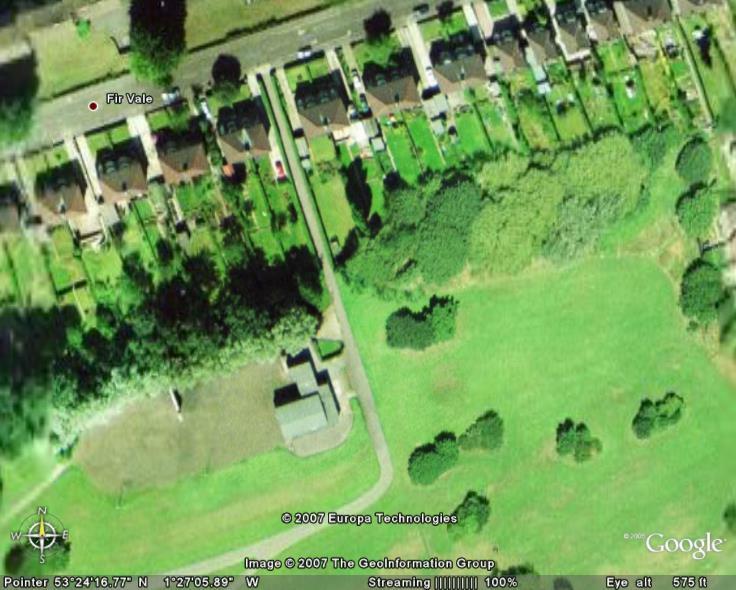 in the attachment from google earth this area is covered with trees but in the late 80's about 89 this area had only just been planted with trees. this made me and my friend both go cold, and we both could not believe what we had just witnessed. i only remembered this event when looking at this book with my partner and he said to me one night when i was walking through osgathorpe park i saw this man walking across the top of the gennel from right to left about twenty yards in front of me and when i looked to my left to where he walked he was not there! Schofield's (originally Cockayne's) in Angel Street is still standing. It is now Argos Extra. Hi Donna. Your story reminded me of something told me by a friend who although now in her eighties, is as bright as a button. She has told me this story many times over the last forty or so years and it never varies. During World Ward Two, she and her sister set off one sunny evening for a walk. They went much farther than they intended to and daylight was fading, although it was very late as BST had been extended much more than one hour. They had decided to take a short cut home via the wood at Grenoside - a route they had often taken and knew very well. Suddenly they saw a man before them - dressed in a long coat and sandals on his feet. He had long flowing hair. As they approached him he said he knew they were in a hurry but why? They replied they wanted to get home before it became dark and the blackout began. He said Don't worry, you will get home quite safely - go that way as it is quicker. They thanked him and proceeded, not realising he did not know where they lived. They turned round to speak to him - he had vanished into thin air. She is adamant to this day that she met Jesus Christ that evening. The Ghost of Frank fern. 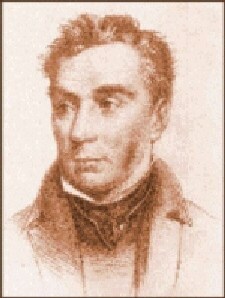 In 1783 Frank Fern robbed and murdered a Sheffield Jeweller who was walking over Loxley common. He was captured the next day and after his trial was executed, his body was hung in chains on a gibbet close to the scene of the murder. The gibbet post was still standing as late as 1810 and it is said that even now anyone walking out there at midnight can hear the sound of the clanking chains of the gibbet. In 1969, I worked evenings at the Park Cinema, which was no longer a picyure house but a Star Bingo. One of my jobs at the end of the night was to go upstairs to the Circle ( which was no longer used) and turn out all the lights ( some of which were the old gaslights). One evening as I was going in to one of the upstairs corridors from the Main Circle to turn out the corridor lights I felt a rush of cold air and an overpowering smell of violets and the gas light on the wall belw out. I had a torch so apart from freaking a bit at the initial shock I "calmly" ran out. I was told the story at the time about a young woman who was either murdered or disappeared around there but I can't remember the ins and outs. I'll see if I can chase the research up about the Park Cinema. There was also a Park Cinema in South Street. It stood in the middle of what is now Park Square roundabout. My mum used to work as a cleaner at Brook School on Richmond Road back in the 1960's and 1970's; as I've lived in Essex for more than twenty years I've not been round that area for ages and have a feeling it was demolished some time ago. That whole area used to be part of the estate of the old Manor Lodge and I can remember the big old house that used to be there which was demolished round about 1962 or so. There used to be brick built gateposts on Richmond Road at the very top of Ravenscroft Road which marked the entrance to the estate and Brook School itself was built on the site of the former hunting lodge. Anyhow Brook School's caretaker from when my mum was there used to tell her about all the ghostly goings on within the school. The caretaker saw the headless ghost of a coachman on many, many occasions within the school and my mum told me on many occasions of lights mysteriously switching themselves on in locked up parts of the school. Naturally they left it to the caretaker to switch them off! The brook school and collage has now been demolished and houses now stand there,My nan and mum used to clean there and i worked as a security guard when it was derelict and belive me it wasnt a nice building one night i was on patrole in the link classrooms and 6 doors slammed behind me in just seconds this was not possible because of the distance between them it would have taken six people to do it. And also a workmate was stood in front of me i saw him turn white with fear as i looked i saw a shadow move and he said he saw a tall figure this happend in the boys toilets.I feel sorry for those that bought the houses rather them than me . Has anybody heard of the Baslow Dakota Ghost Plane? My Mum was driving up the Baslow Road towards Owler Bar roundabout a couple of weeks ago, well she drives a soft top so had the roof down on this hot evening. There were a few cars in front of her and behind her so she was going pretty slow. Anyway suddenly she spotted this very large bomber WW2 style plane. Anyway she says it was flying really low and flying from side to side. Flying right over her she was so convinced it was going tocrash behind her she braced herself for a MASSIVE explosion...which never came. She carried on up to Owler Bar at which point you have a really good view over the whole valley but the plane had totally disappeared. Looking back on it she can't remember any noise either, anyone who's seen a WW2 bomber will know how noisy they are so she would have heard, especially in a soft top. Anyway she told this all to my Dad who has heard about a Dakota 'ghost plane' being spotted numerous times on the Baslow Road. Has anyone else seen this or know anything about it?! Not that uncommon, as there have been many sightings of Ghost Planes in The Peak District. Have read through this ... GHOST PLANES OF THE PEAK DISTRICT OF DERBYSHIRE it mentions more than one Dakota. Was the Ghost Of Stocksbridge Bypass a monk? Apparently a couple of monasterys once stood near to the location. includes first hand reports and an interview with a local bobby. if you believe this video then The Ball Inn pub Grimesthorpe. Halloween coming up soon; any further additions from newer Members please ? [Who is the blokie on Codeyes avatar ? Answers on a postcard please. More from MysteryMag relating to The Ball Inn and The Wellington. Relatives of mine lived in a big, very old cottage in Sheffield. The cottage had two main downstairs rooms, one of them effectively double sized. During the fifties they lived in the smaller room and the other one was unfurnished and empty. At the time the front garden was sometimes visited by a completely white albino blackbird which naturally interested me. One summer evening I was stood in the bay window of the empty room looking out for this blackbird until it went dusk. Reluctantly I gave up my survey and turned to return to the family in the other room. As I stepped out of the deep bay and started to walk towards the other part of the room where the door was, I became affair of a very bright apparition which was suspended in mid-air about 4 feet in the air and a foot out from the chimney breast. It was a severed right hand, palm towards me and looking very real. At the age of about 11, I was terrified and stood there for ages until the thing very very slowly faded from view. I hadn't been listening to any ghost stories and ghostly apparitions were the last thing on my mind when I saw it. I cannot think of any explanation for the thing because it was definately in 3 D and holograms were still a long way in the future. I may be a sceptic in other things, but since that day I've had an open mind about ghosts. Sister used to live on a farm at the top of the hill, is that Greenmoor ?